Gus Olivarez holds up a smaller? striper before releasing it!! Looks great to me!!! 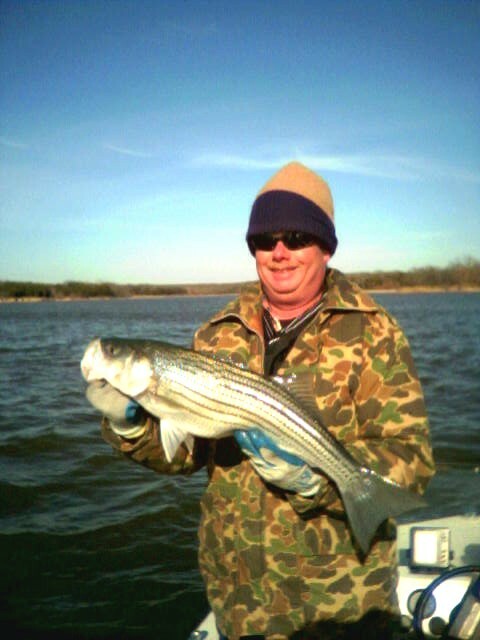 Daryl Beals (Bulletbob's Brother-in-law) holds winter striper from Lake Texoma on Oklahoma--Texas border. The pictures were taken by Gus Olivarez with his picture cell phone. 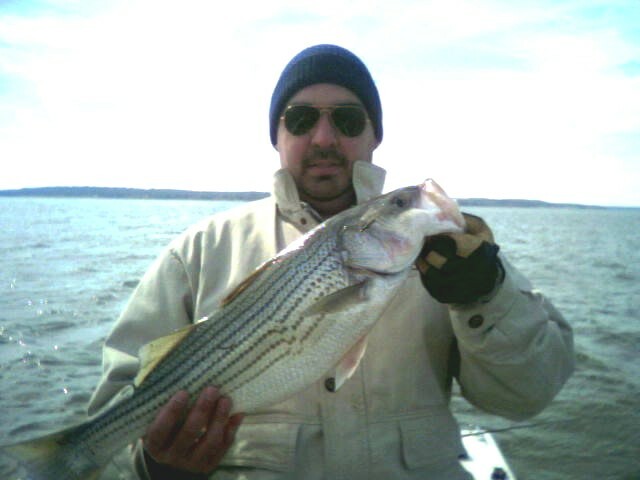 Al Alambar, Gus, and myself (amateur guide) were at Lake Texoma on Wednesday, February 9, 2005. We put in at Cedar Mills Marina at 10:30am, came out of Big Mineral Bay and immediately found the birds working off of the Big Mineral end of the Texas Flats. We had our limit of Stripers over 20" by 11:00am. We were using chartreuse or white 1oz. sassy shad. We continued to catch and release large stripers all day. The largest was 12 pounds, caught by Al. Most of the fish were in the 8 to 10 pound range. By 5:30pm we were finally able to boat 12 fish under 20" so we called it a day and went in to clean with 6 fish over 20" and 12 fish under 20" and sore arms from all of the other BIG FISH we caught and released. � Copyright 2005-2007 Fishingfanatic.Com All Rights Reserved.